This Idiot Cracks Me Up! Yesterday, for my audience in Florida, I spoke at length about the fact that we don’t need to look far to find humor. People hire me to come across the country to help them — and their organizations — find their senses of humor. This photo provided by the Ashland Police Dept. shows Kasey G. Kazee, 24, of Ashland, Ky.,who was charged with first-degree robbery, according to Ashland Police Sgt. Mark McDowell. Kazee had his head wrapped in duct tape to conceal his identity when he tried to rob Shamrock Liquors. 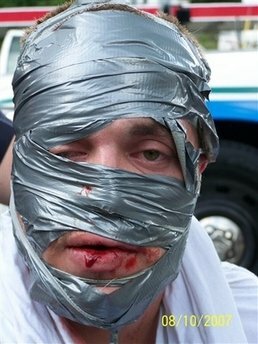 Seems to me that one of the best punishments would be to just let him get the duct tape off himself. Ouch. It’s just hard to know where to start. But I can tell you it ends with laughter. https://www.bradmontgomery.com/wp-content/uploads/2018/11/logo-1-495x198-1-300x120.png 0 0 admin https://www.bradmontgomery.com/wp-content/uploads/2018/11/logo-1-495x198-1-300x120.png admin2007-08-16 13:33:092007-08-16 13:33:09This Idiot Cracks Me Up! Emcee / Master of Ceremonies Calls Nurse from the Stage! I Hate Motivational Speakers.